If you are an ardent Techzim follower you know that we have been selling airtime since November here on our platform. To buy the airtime you just visit our site and click this link and go through a simple process. That’s all good. Anyway, we figured out that not everyone who has internet bundles at anytime to access our site but some may just have Facebook bundles (only) but they would still want to buy our ‘cheaper airtime’. So, we decided to make it possible for those with Facebook bundles to buy airtime from us as well. And the process of buying airtime from our Facebook is quite easy. You literally just go 3 simple steps (of keying in your information) and our bot will deliver your airtime immediately. 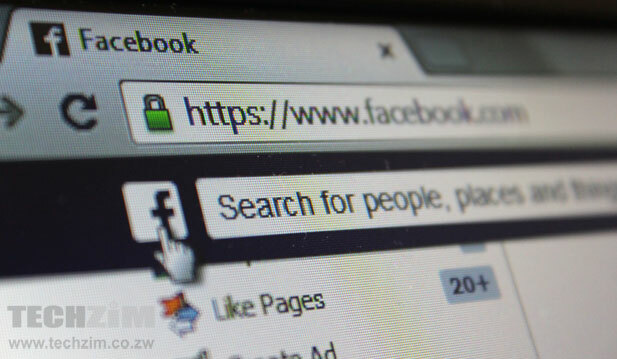 Now, how do you buy airtime on Techzim’s Facebook page? The bot will reply telling you how to input your details. If you want to buy a dollar’s worth of Netone airtime, for instance, you just input: 1#0718917XXX#0773870XXX. Where “1” will be the amount of airtime, “0718917XXX” will be the number to which your airtime will be credited and “0773870XXX”. You know that sometimes technology spoils the fun, you might input all your details correctly and pay but your airtime won’t get credited. In that case, you can just contact us by sending a message in the same inbox or write us on our Facebook Wall and then we will solve your problem. That’s when the ‘order number’ and phone number, you see at the end of your purchasing process (as you can see in the screenshot), will come in handy. 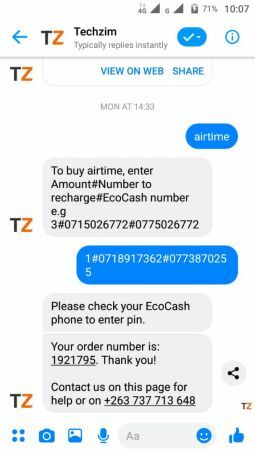 P.S Unfortunately, at the moment you can only buy airtime from on Techzim’s Facebook by paying using Ecocash only.